Much of Wimbledon was rather flat this year due to World Cup frenzy coinciding with the Championships. Even some of the players appeared to want to cheer on their teams rather than play their own matches. But football was no-where to be seen in the public sphere. No announcements about goals, not one non-tennis screen in sight. So, crowd attention was divided between the live tennis and the football on i-phones. I suspect massive cheers at England goals were pretty off-putting for players. I don’t know if they came during rallies because I too was watching the football at that point. So, to the tennis. Let’s start with the women. The women seeds fell like ninepins in the first week. Only one seed within the top ten, Karolina Pliskova, made it through to the second week. I suppose you could call Serena Williams a top-tenner but, after an extended lay-off due to pregnancy and subsequent recovery, she was down to 25th seed, which made her a dangerous floater. 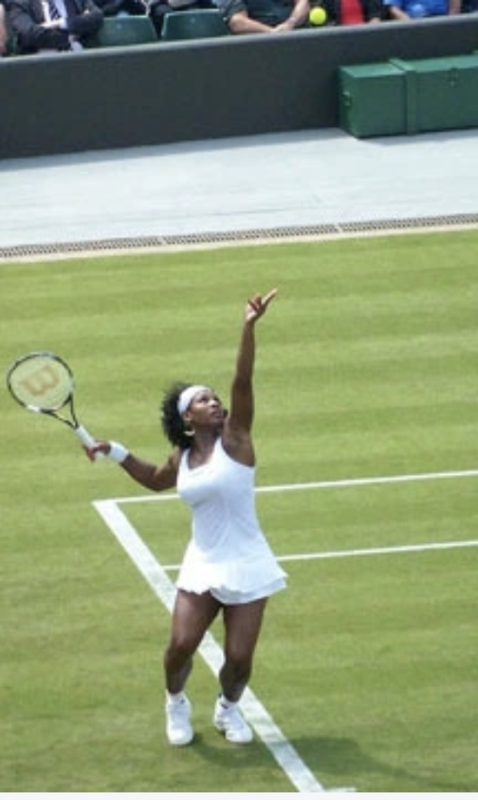 When Williams wins a crucial point, she pumps her fist, doubles over and screams like a wailing banshee. I’m not sure how sporting that is, especially after an opponent has made an unforced error, but, like Becker in his heyday, she cannot, cannot stand losing. It has to be intimidating. In the quarters, Jelena Ostapenko (former French Open champ) put out the “pocket rocket”, 5’3” Dominika Cibulkova. 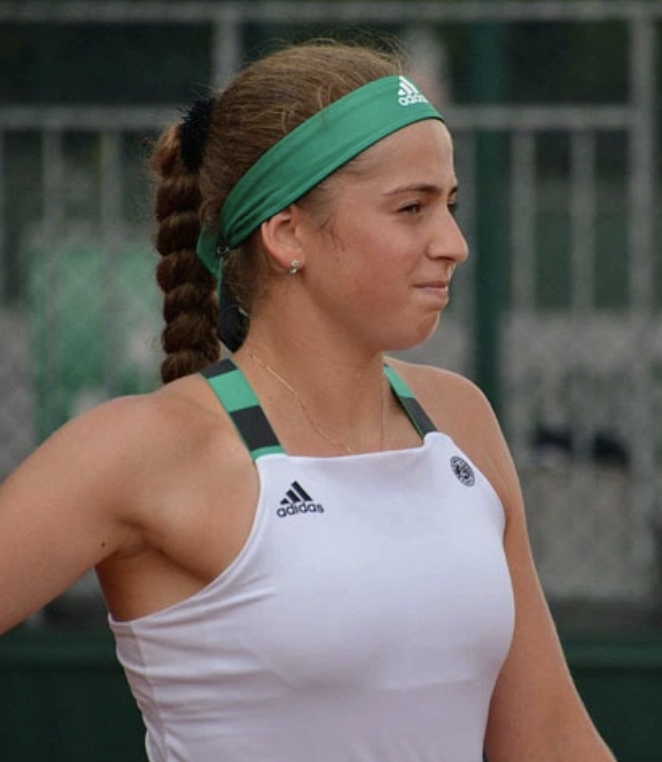 Ostapenko goes for broke on virtually every shot. She is also one of the few female players who wears shorts, which I find absurd, since shorts are so much more comfortable than the short skirts which their sponsors no doubt insist on. Talking of which, Belgian player Alison Van Uytvanck rushed to kiss her coach and girlfriend after her third round win, which caused a bit of a stir. There were some reasonably close quarter-finals with a couple going to three sets but the semis were rather damp squibs, both being straight setters. Serena, unsurprisingly got to the final, her opponent being Angelique Kerber, who’d never won this tournament. Kerber managed some extraordinary retrieving and finally wore Williams down in straight sets. Meghan Markle was rooting for her friend Serena from the Royal Box, but other than that, Kerber appeared to be the crowd favourite. Serena’s a bit of a marmite player; you love her or hate her. Let’s just say that I was happy Kerber won. 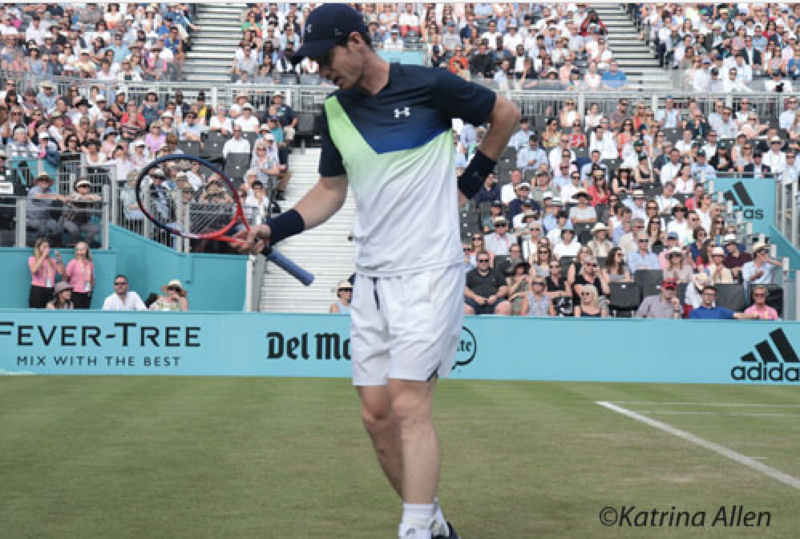 Sadly for the Brits, Andy Murray pulled out of the tournament due to an ongoing hip injury which has been plaguing him since last year’s championships. 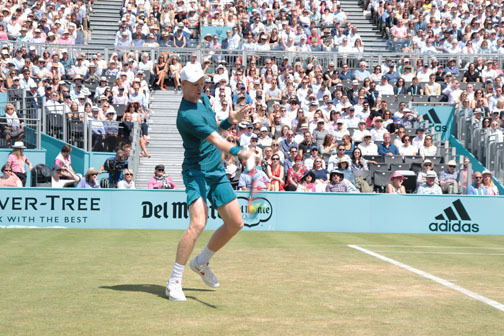 The only other realistic British hope, Kyle Edmund, did well but lost to Djokovic. Edmund is good but he’s no Murray. Anderson went on to beat the favourite, and international heart-throb, Roger Federer, 13-11 in the fifth set and I briefly went into mourning. I think almost everyone does when Roger loses. By now, World Cup fever over after England’s exit, and locals able to concentrate on the tennis, the tournament really took off. The men’s semis produced an epic between two heavy servers – John Isner and Kevin Anderson, the latter winning 26-24 in the 5th after 6.5 hours, the longest semi ever; which prompted cries of “tie break in the final set please”. It has to happen sometime; maybe at 12-12 would be a good compromise. Which meant the match that everyone was really there for, Nadal vs Djokovic, didn’t start until 8.00 pm and, much to the annoyance of the crowd, was stopped at 11.00 pm due to the local curfew. Which also meant that the crowd who had women’s finals tickets the following day had the unexpected treat of the end to that match. Their final set was breathtaking, some of the best tennis I’ve ever seen. I was torn between wanting Rafa to win and not wanting the match to finish – ever! This really should have been the final. It was so dramatic. Anderson vs Djokovic in the final. Would Anderson manage to stay upright for the whole match after his marathon semi? I think everyone was fearing a complete whitewash. 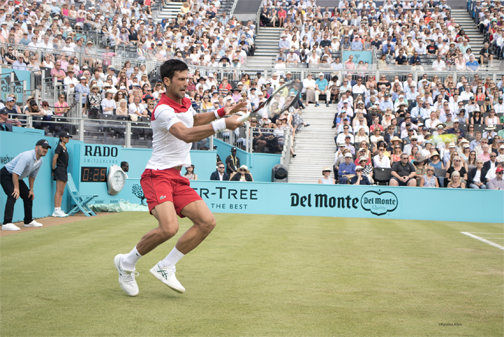 And that’s how it looked in the first two sets, which Djokovic breezed through 6-2, 6-2. Impressively though, Anderson didn’t completely fold. He even had set points in the third set, courtesy of a few Novak double-faults. He managed to force a tie-break which Djokovic won fairly comfortably and, with that, his fourth Wimbledon title.